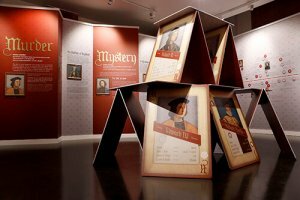 StandOut Graphics, who specialise in bespoke large format printing projects, has completed the print and installation of a new exhibition at the King Richard III Visitor Centre in Leicester. 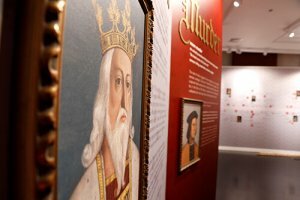 Titled ‘Murder, Mystery and Mayhem’, the exhibition retells the history surrounding the Wars of the Roses and King Richard III’s rise to power. The Leicestershire-based company was commissioned by Juice Creative Design Ltd who created the concept and artwork for the display. 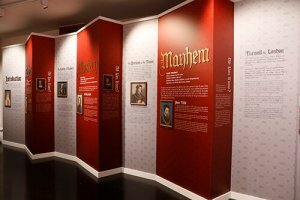 The exhibition comprises a series of printed 1.2 x 3m panels as well as a three-dimensional ‘House of Cards’ display featuring key figures from the Wars of the Roses. To create the printed panels, StandOut Graphics needed a large format wallcovering that would be hardwearing but also give a premium finish. They had seen lots of pre-pasted grades but wanted a textured reel with adhesive, at the right price. Antalis Account Manager, Claire Cooper, showed StandOut Graphics’ Director, Tom Noon, a number of wallcoverings from the Coala range, including a sample she had of a brand new product, Coala Silky Wallcover Textile. Tom and Juice Creative Design liked the textile finish of Coala Silky Wallcover Textile and the fact that it has a self-adhesive backing. Tom also found that the product absorbs ink nicely, giving a high-quality, durable finish. Print: Wall panels – The Coala Silky Wallcover Textile was put through a Vivid Laminator to apply it to in-house CNC’d wall panels of melamine-faced MDF before printing three panels together at a time. 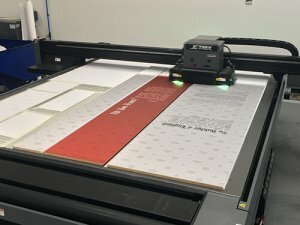 While it is unusual to wrap product around panels prior to printing, Tom explained that as well as being more time-efficient, it meant that they could also guarantee the images on the panels would be perfectly aligned. The end client had also indicated that information on the panels might need to be updated, so printing this way meant it would also be easier to remove and update individual panels. The wrapped panels, along with various 3d elements to be affixed to them, were printed on a JETRIX KX7 using the highest setting (fine art). The oversized playing cards used to create the ‘House of Cards’ 3-dimensional display were made from Kapa®Tech 10mm, printed directly onto both sides, again using the JETRIX KX7. The giant playing cards were edged by hand with 1mm PVC edge tape to conceal the foam centre. A DYSS X7 2230T digital cutter was used to cut out the acrylic shapes, canvases and ‘House of Cards’. Fitting: The panels were affixed to the bespoke joinery by StandOut Graphics’ sister company, Stand Innovations. Tip: Save valuable time and ensure image alignment by printing adjoining panels at the same time. Coala Silky Wallcover Textile 170g is a PVC-free, woven, self-adhesive fabric with a blockout layer. The specially designed adhesive makes it possible to reposition and remove your graphic without leaving a residue or damaging the surface it is applied to. Existing graphics do not show through due to a blockout layer. Since this product has a B1 fire rating it is an ideal solution for interior decoration. Coala Silky Wallcover Textile is available in 3 standard sizes.